Some fabaceous plants in the Maryland piedmont bloom in the spring, but most of the family wait until high summer to get going. The bloom times stated below are approximate – especially early in the season, when they can vary by one or two weeks. 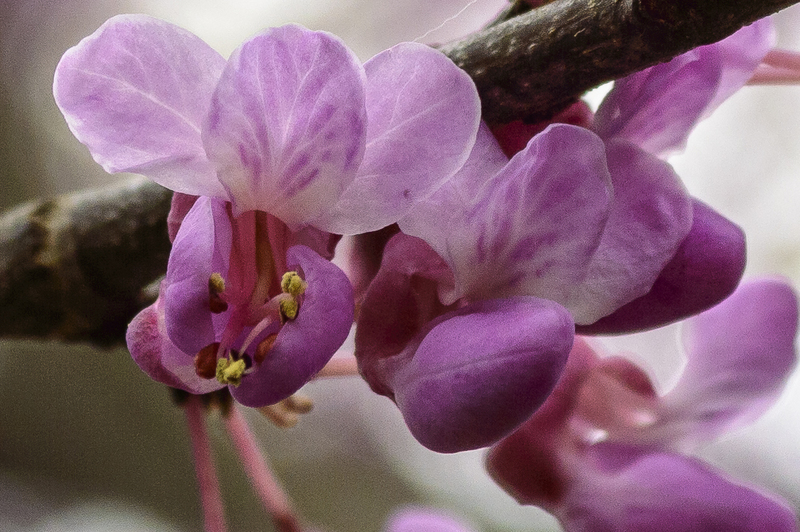 By my observations, the earliest blooming fab in the Maryland piedmont is the redbud (Cercis canadensis), a lovely understory tree that usually starts flowering in May, about the time the dogwoods are finished. It’s a nice addition to a native landscape garden except for one thing: it fruits profusely. 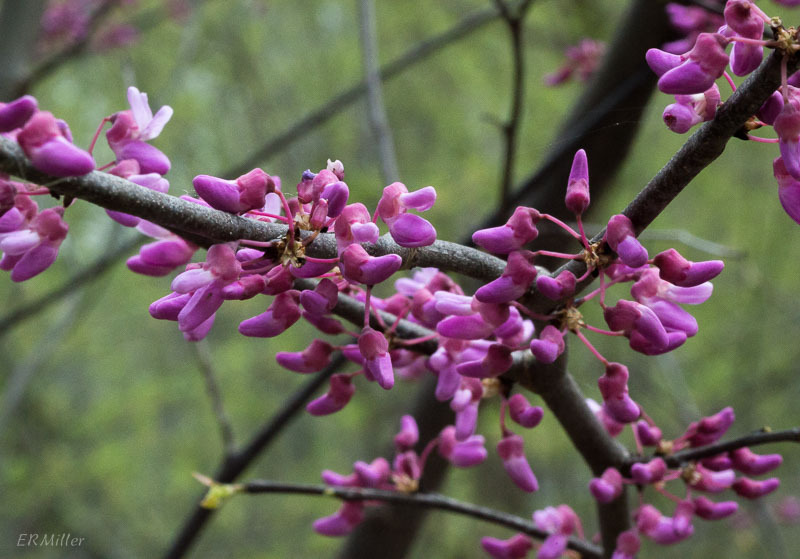 The pods are easily raked up with autumn leaves, but invariably some will escape your attention and the following spring you’ll be pulling redbud seedlings out of your garden. (Ask me how I know.) Also, it can grow lanky and the wood is somewhat weak. The tree (and therefore your garden) benefits from thoughtful pruning. 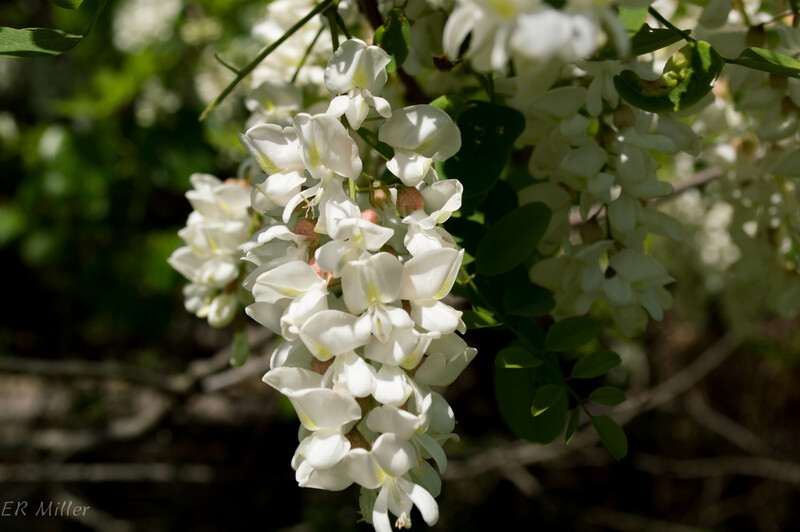 Black locust (Robinia pseudoacacia) can be a spectacular tree in May when flowering, if it gets enough sunlight. 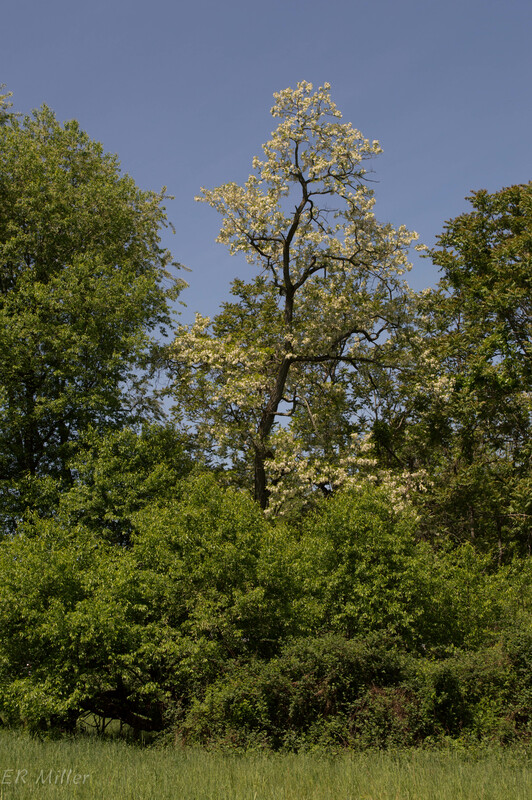 But more often you’ll see it in mixed deciduous woodlands, growing very straight and tall with the blossoms hidden in the canopy. The wood is incredibly rot-resistant, making for long-lasting fencing, and has very high BTU value. However, the trees blow over easily and will even shear off horizontally in the right conditions. Again, ask me how I know… At my previous house any time a black locust would break off, I’d cut up the wood for the fireplace but leave the stump for the birds. An eleven-foot stump in my front yard served as a feeder for pileated woodpeckers. Sometimes I miss that place. Another May bloomer, wild blue indigo (Baptisia australis) is on the RTE* watchlist (S3) in Maryland. I know of two distinct stands of it along the Potomac, where it grows with Culver’s root (Veronicastrum virginicum). 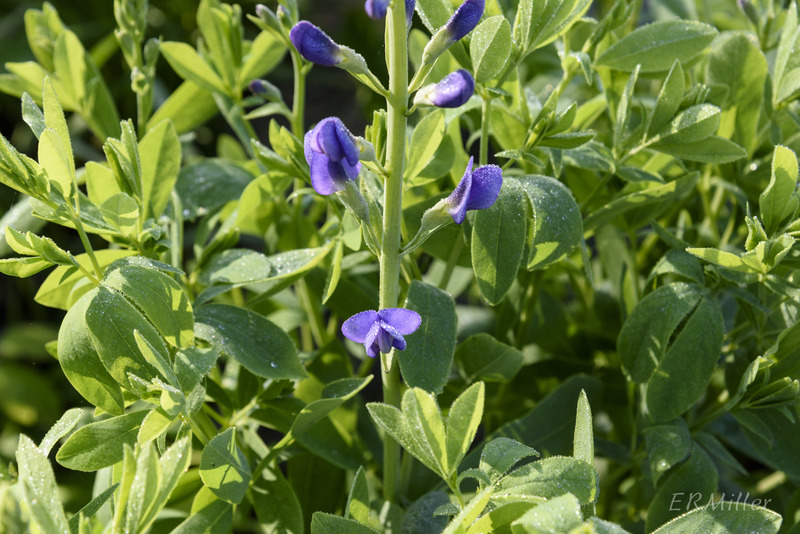 I grew wild blue indigo at my previous house, and it is a profuse bloomer. It’s a stunner in the garden but the seedpods are so numerous and heavy, they pull the plant right over. And they germinate in great numbers. If you remove the pods, though, it’s a well-behaved plant. Also blooming in July, more or less, is the closely related Hylodesmum nudiflorum (formerly Desmodium nudiflorum; naked-flower tick-trefoil). 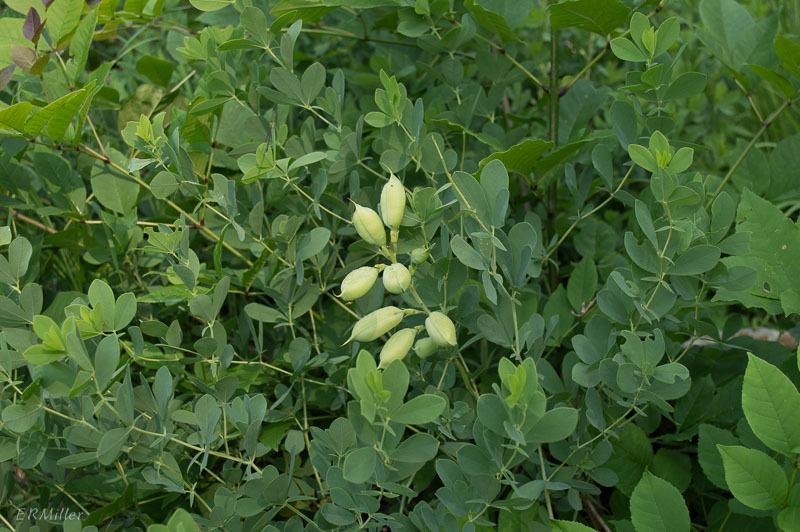 This one is easy to distinguish from other tick-trefoils because there are no leaves on the flowering stem. 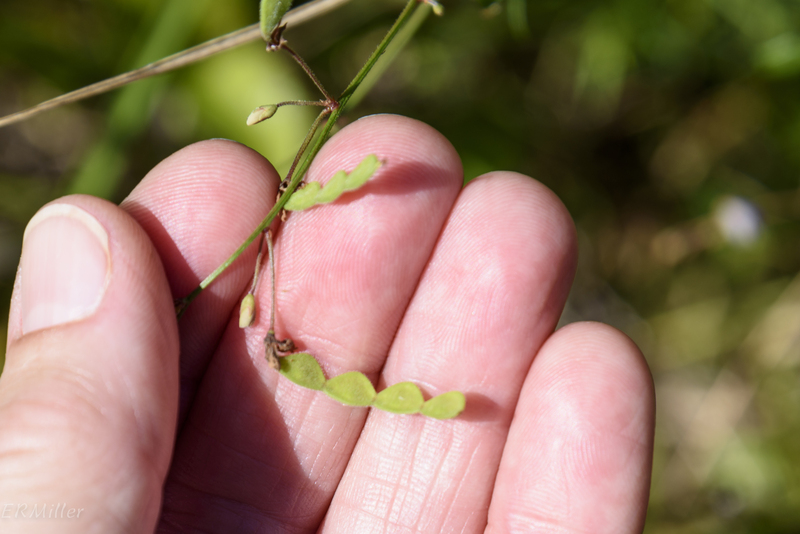 It grows in more or less the same conditions as the pointed-leaf tick-trefoil, except maybe it wants a bit more sun. Clitoria mariana (butterfly pea or Atlantic pigeonwings) blooms from late June into August. 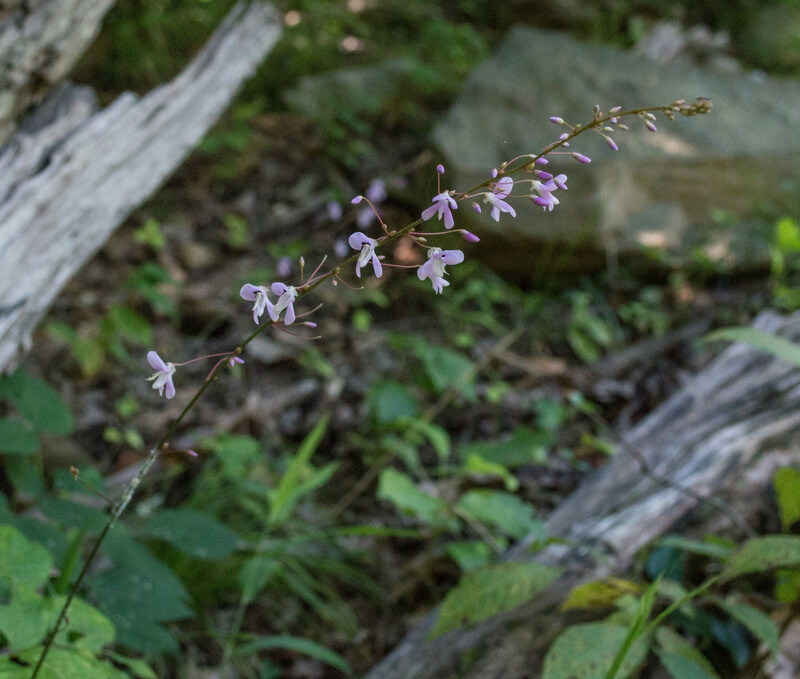 I’ve seen it in a few places in the Potomac gorge, never in large numbers (usually just one plant growing alone), mostly in open, rocky places. The plants are vining, and stay fairly close to the ground. 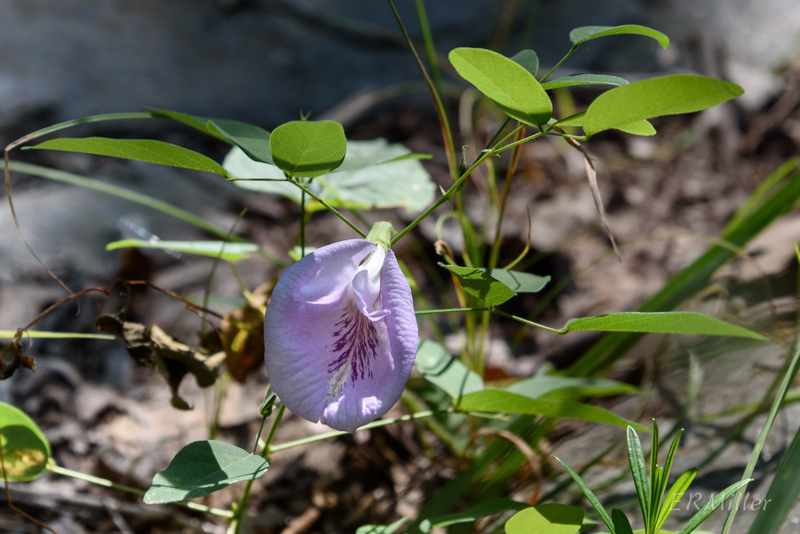 Butterfly pea is endangered in New Jersey and Pennsylvania. 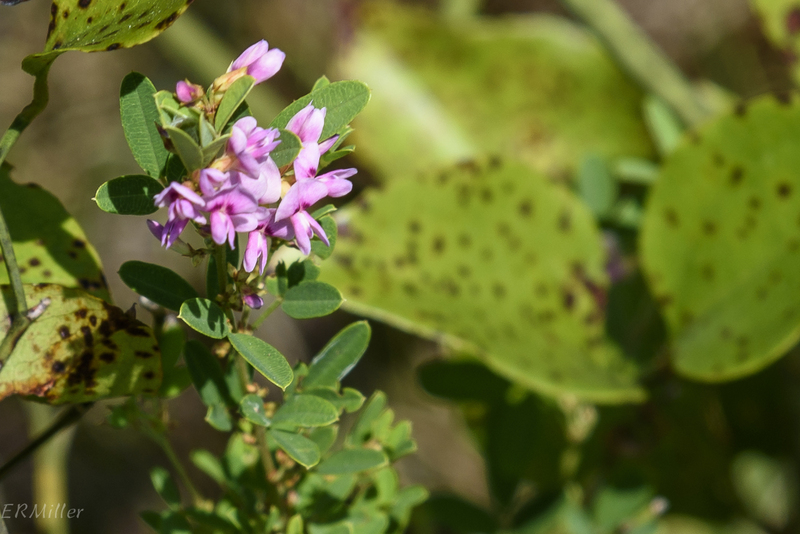 Panicled tick-trefoil (Desmodium paniculatum) blooms in late August. It grows in moist to dry soils in sun to part shade, and does well in disturbed areas. Lespedeza virginica (slender bush-clover) is sadly not nearly as common as its alien cousin, Lespedeza cuneata (Chinese bush-clover). 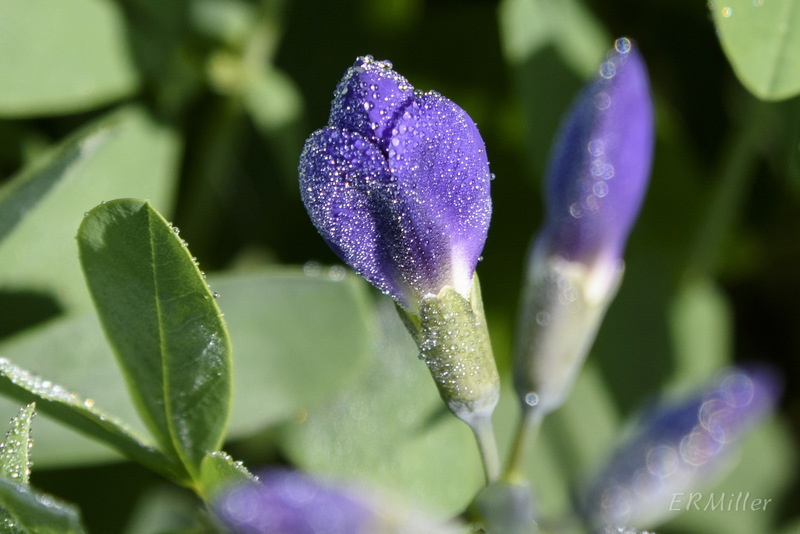 You’ll often see the two growing together in dry soils in sunny areas, blooming in August. Slender bush-clover is threatened in New Hampshire and Wisconsin. 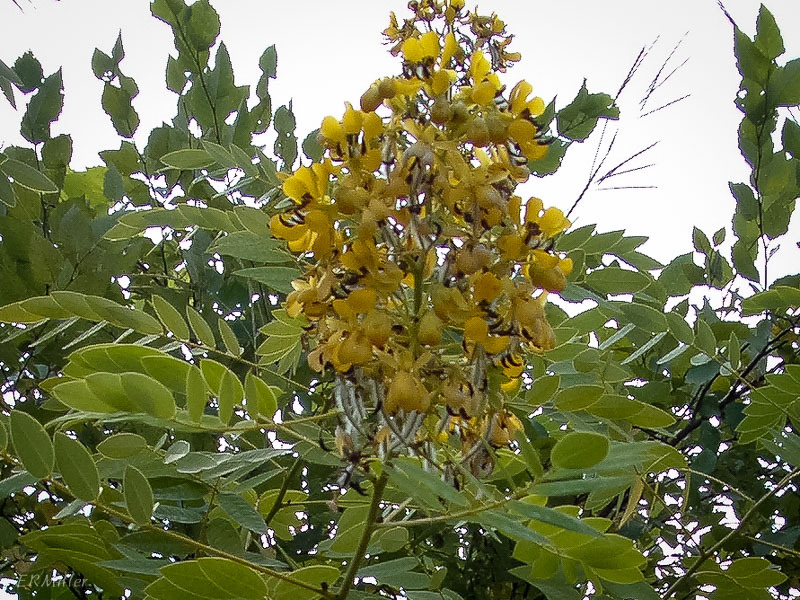 Senna hebecarpa (wild senna or wild cassia) is another August blooming plant. It grows up to six feet tall, with rigid stems that seem almost to lignify, and often in such masses that it could be mistaken for a shrub. It’s endangered in Massachusetts and New Hampshire, special concern in Connecticut, threatened in Vermont, and historical in Rhode Island. 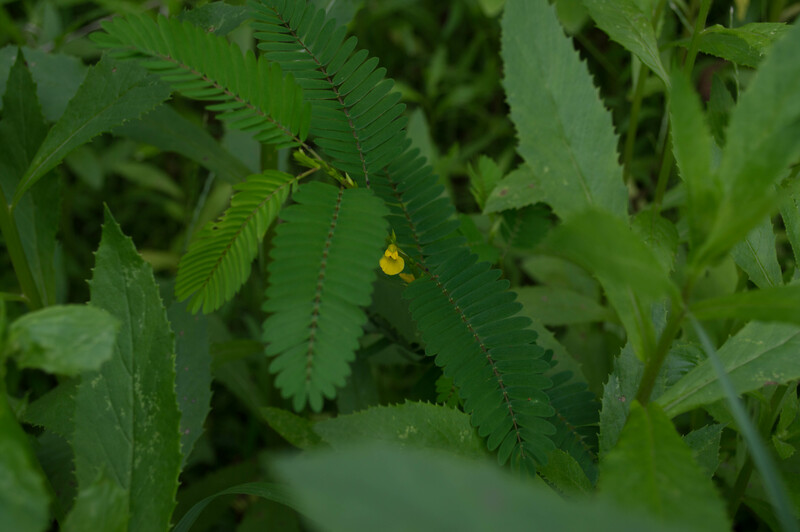 Wild senna has a nearly identical cousin, S. marilandica, that is rare (S3) in Maryland; Maryland Biodiversity Project has no records for it. 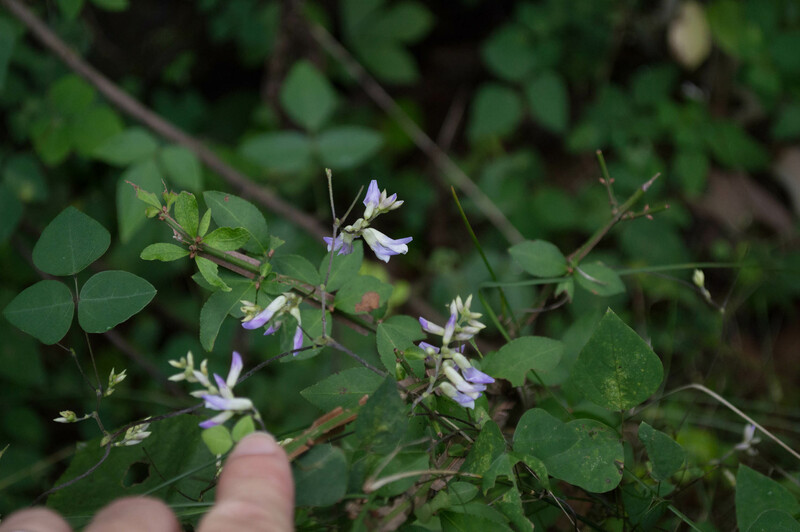 Amphicarpaea bracteata (hog-peanut) is a shortish vine that stays low, twining through other plants, blooming in late August. And pink fuzzybean (or pink wild bean, or perennial woolly bean; Strophostyles umbellata) is another August blooming vine. It’s endangered in New York and threatened in Rhode Island. According to the Biota of North America Project, the pea family is second only to the aster family in number of native species in North America, with 1,277 species. Worldwide it’s the third largest plant family, with about 18,800 species in over 600 genera. 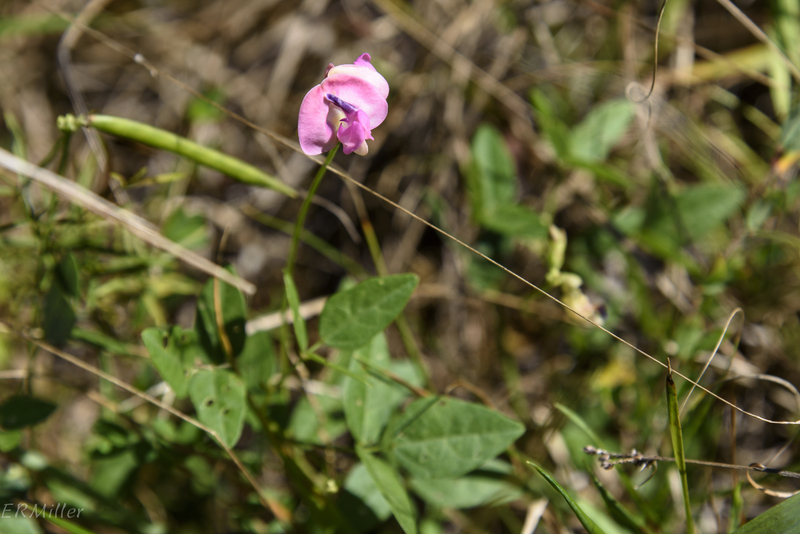 The Maryland Biodiversity Project has 161 listed pea family species, though many are alien. Not quite half of these species are present in the Maryland piedmont. These flowers have their own terminology: the uppermost petal is the banner, the two side petals are the wings, and the two bottom petals, fused together, are the keel. 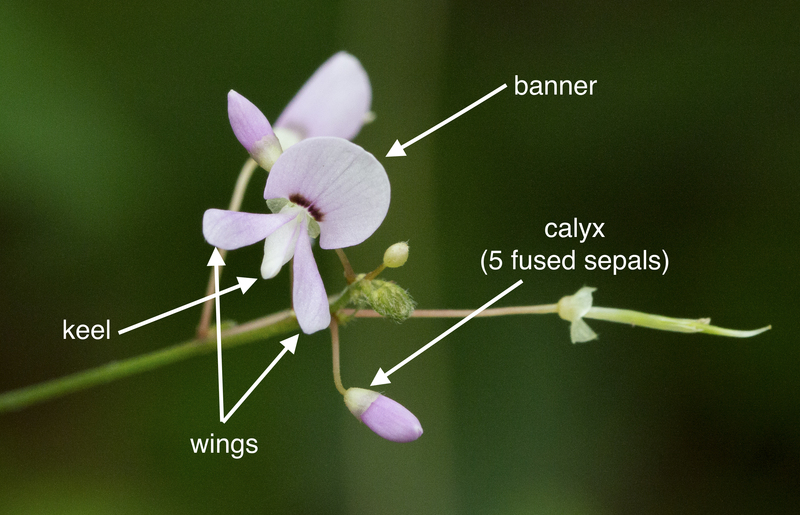 Flowers in the Caesalpinoideae are much the same, except that the two bottom petals (keels) are not fused. Fabaceous fruits are usually either legumes or loments. Botanically, a legume is a type of dry fruit that usually opens along two seams at maturity (like peapods). A loment is a legume with a jointed pod. Of course this family is of major agricultural importance. Fabaceous foods include peas, beans, peanuts, lentils, soybeans, and tamarind. Alfalfa and clover, among others, are significant forage crops, for honey bees as well as our domesticated herbivores. And just as the euphorbs have latex, some fabs have natural gums, widely used in food manufacturing, cosmetics, and pharmaceuticals. “Euphorbia” sounds like “euphoric”, so of course I spent a little time researching it. I found a detailed account that goes back to the Natural History of Pliny, first published in AD 79. Seems the plant was named for a physician, Euphorbus. “Euphoric” can be translated as “well-fed”; it’s from the Greek “euphoros”, which means “healthy”. The whole story, as well as much more detailed information about all aspects of the family, can be found at the Euphorbia Planetary Biodiversity Inventory Project website. This was a magnificent specimen, standing about two and a half feet tall, growing right out of a cleft in the rock along the Billy Goat A trail near Great Falls. The plants seem to like rocky places, at least in the Potomac gorge. Watch for them blooming in August, also on Billy Goat B and at Serpentine Barrens Conservation Park. Those white parts aren’t petals, of course; they’re bracts. The actual floral parts are contained in the cyathia in the very center. The whole structure measures about half an inch across. This is a truly graceful plant, one of my favorites. I think it would be a lovely motif on a fabric. The spurge family is one of the largest in the world, though exactly where it ranks is difficult to say for sure. There are almost 2,000 species in 300 genera worldwide (except the arctic and Antarctica). Most are tropical, and many are succulent, resembling cactuses; others are typical annual or perennial forbs, and a few are woody. It’s a family of great morphological diversity. It’s also a family of great economic importance. 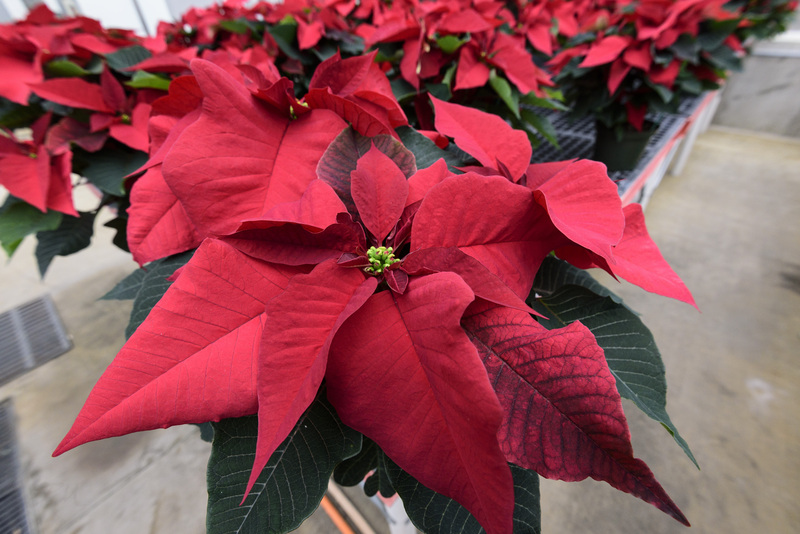 Poinsettias are one of the most widely grown ornamentals. Natural rubber is made from the sap of Hevea brasiliensis. Cassava isn’t much known in the US, except in the form of tapioca, but it’s a staple food in many tropical regions; it comes from Manihot esculenta. The roots are eaten as a vegetable or dried and made into a flour. Castor bean, Ricinus communis, is a particularly interesting plant, appearing on (or topping) lists of most poisonous plants in the world. 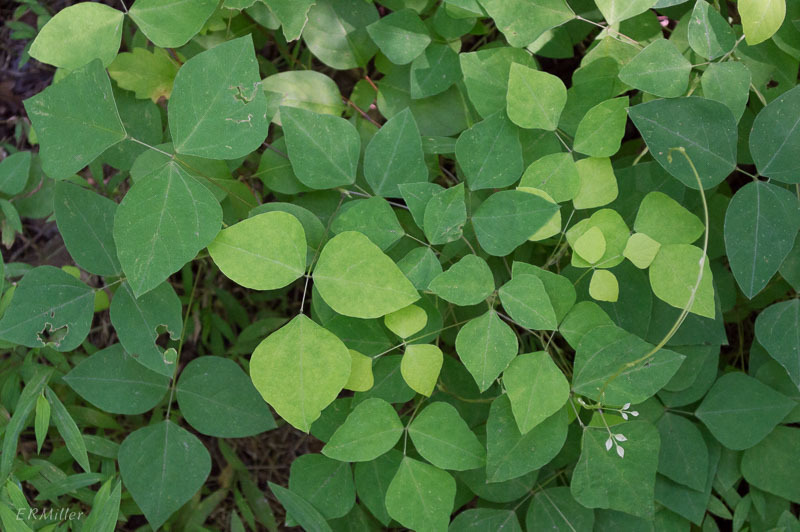 It’s grown as an ornamental for its foliage, but is considered invasive in many places, and is highly allergenic, rating 10 out of 10 on the Ogren Plant Allergy Scale. The oil extracted from the seeds has industrial and medicinal uses, but the raw seeds contain a potent poison (ricin). Castor oil is even used in the manufacture of a food additive, polyglycerol polyricinoleate. Species in the genus Euphorbia tend to have minute flowers. 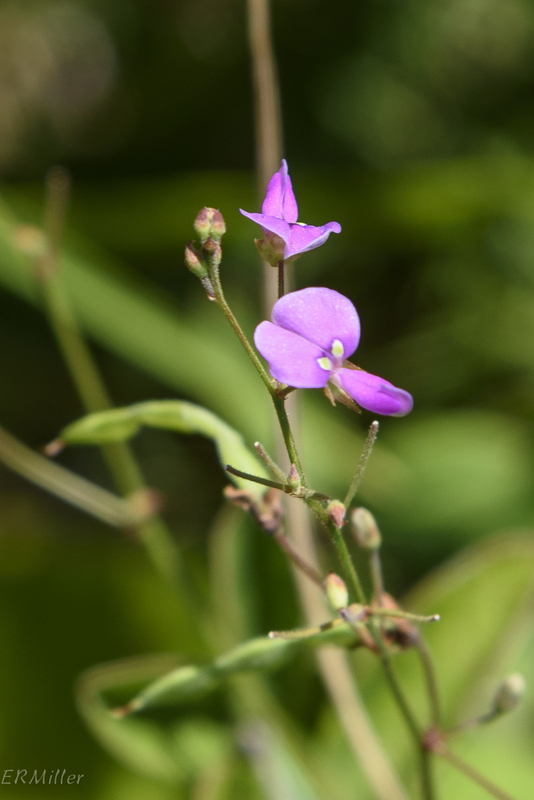 An involucre contains all the reproductive parts, collectively referred to as the cyathium. The cyathium consists of one carpellate (female) flower and several or many staminate (male) flowers surrounded by bracteoles (miniature bracts, or modified leaves). In many species there will be lipped glands (extrafloral nectaries) on the outside of the cyathium. 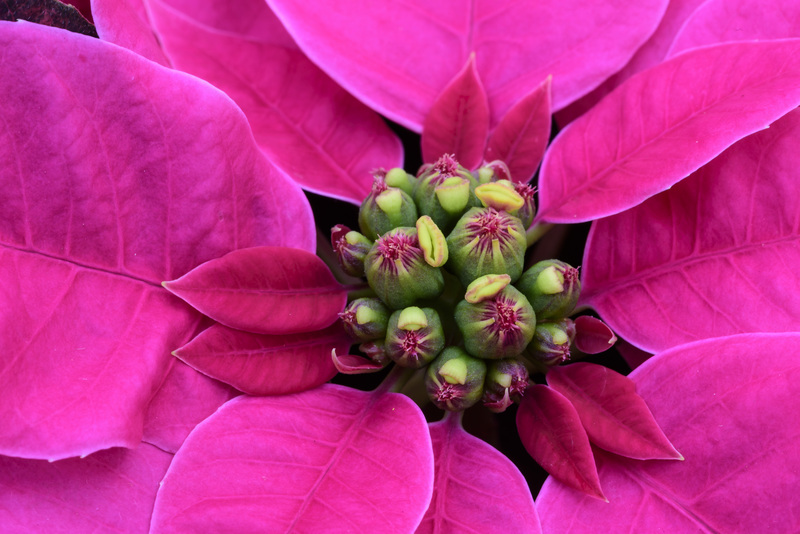 This closeup of a poinsettia shows more than a dozen unopened cyathia with their nectaries, surrounded by the highly colored bracts. Another characteristic common to many (but not all) euphorbs is the presence of a milky sap (latex) in the stems. Generally it’s caustic, more or less so depending on the species. It’s one field test to use when trying to identify plants, but not definitive, as ten percent of flowering plants contain latex*. At any rate, don’t get it on your skin. Of course there are euphorbs in the Maryland piedmont, otherwise I wouldn’t be writing about them. More on those next time. Harbinger of spring, aka salt-and-pepper, blooms as early as mid March, and maybe as late as mid April. It’s listed S3 (watchlist) in Maryland, is endangered in New York and Wisconsin, and threatened in Pennsylvania. 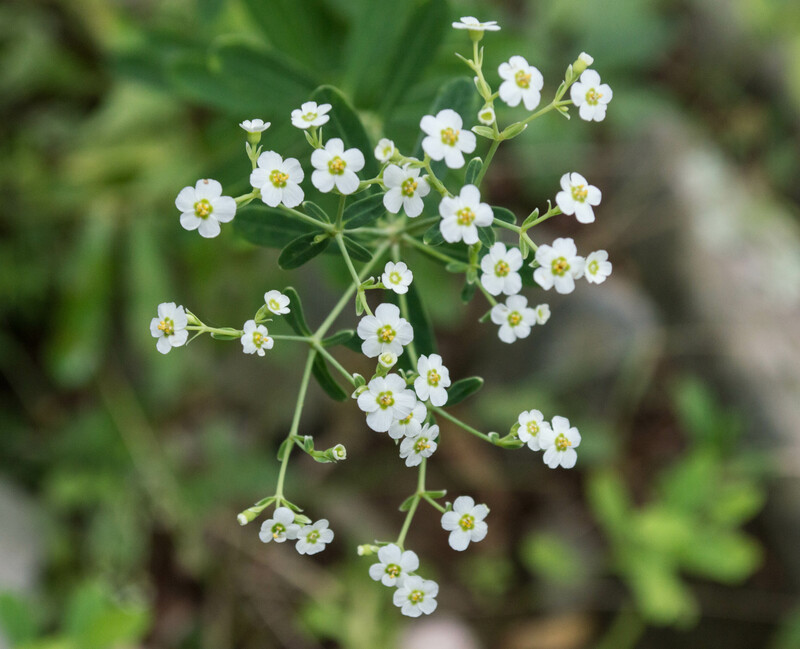 It’s a perennial of rich woodlands, with flowers in compound umbels; there are 1-6 flowers per umbellet and 1-4 umbellets per umbel*. The near umbel in this picture, with four umbellets, is about the width of a nickel. 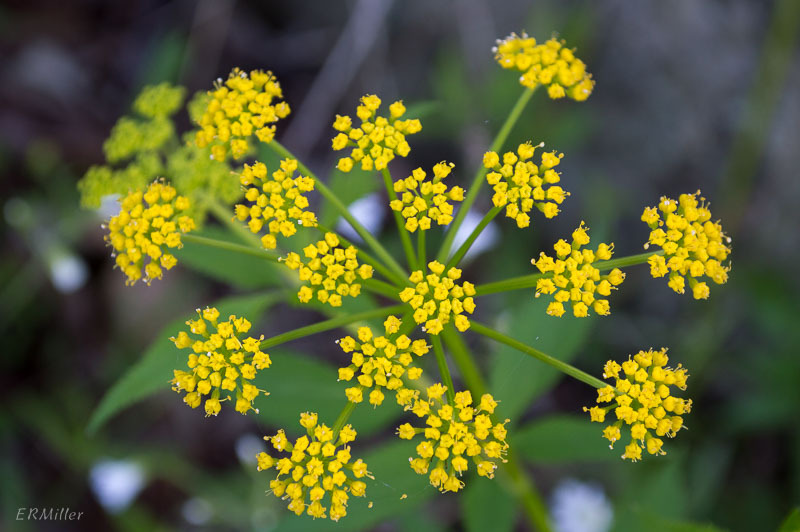 Golden alexanders can bloom as early as late March and if they start later, might last ’til late May. This species is also S3/watchlist in Maryland, and is listed as special concern in Rhode Island. The compound umbels typically have around 12 umbellets, each with about 21 flowers*. 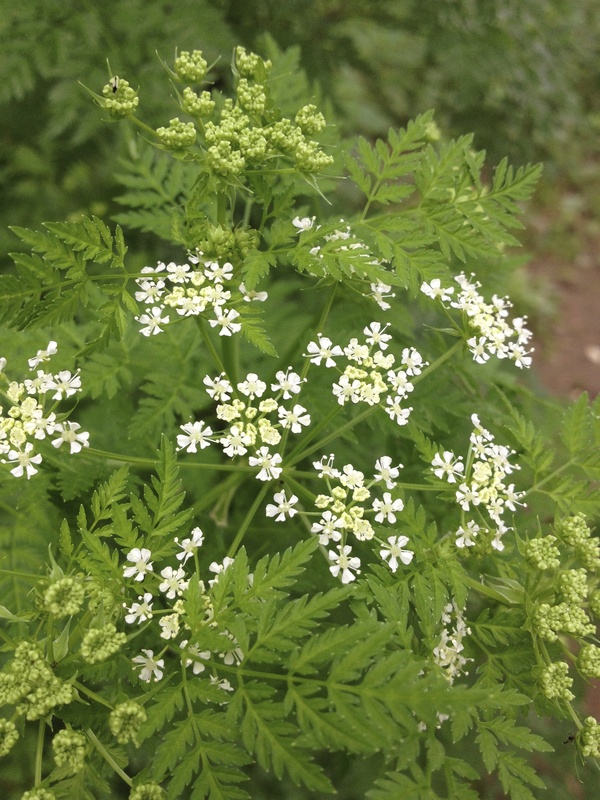 I’ve seen sweet cicely blooming as early as early April and as late as mid May. The plants tend to be in flower rather longer than the previoius two species. There are no conservation issues. This species also has compound umbels, with each umbellet sporting 4-7 flowers**. 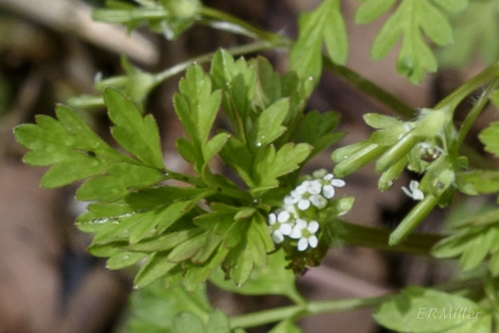 Hairy-fruit chervil generally blooms from about mid April to about mid May. Each flower measures around 3/32″ wide. 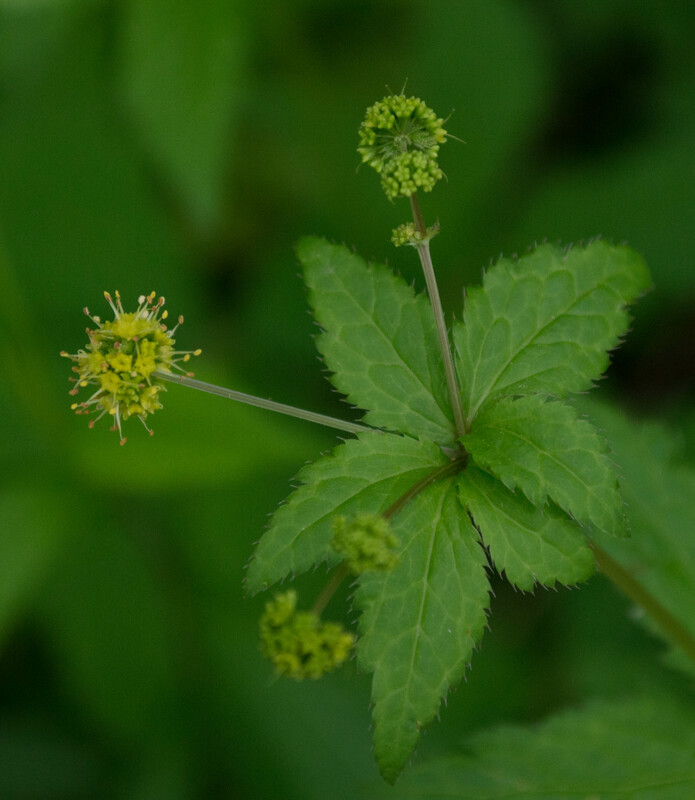 This is another species whose flowers are in compound umbels. There are no conservation issues. Clustered snakeroot blooms for a long period, starting as early as late April and lasting maybe ’til mid June. It’s threatened in Massachusetts and New Hampshire but abundant in the Maryland Piedmont. 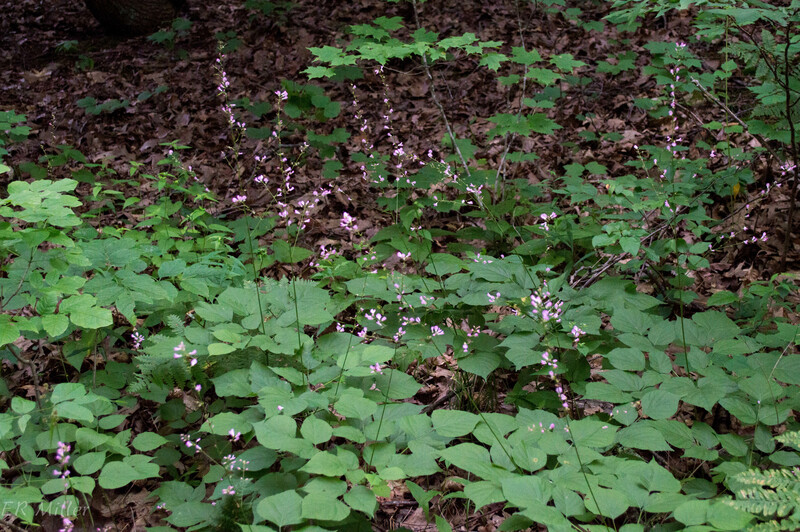 In late May it seems to be a dominant understory forb, growing in great swaths in the woods along the Billy Goat B and C trails and the Cabin John trail. 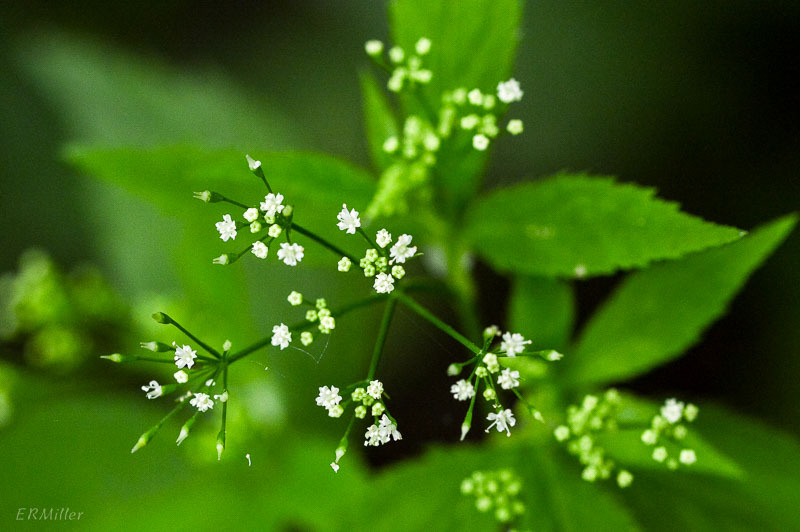 There are 20-60 flowers in each umbellet, and 1-5 umbellets per one-half inch wide umbel*. Honewort also blooms for a long period of time, typically from late May to late June. 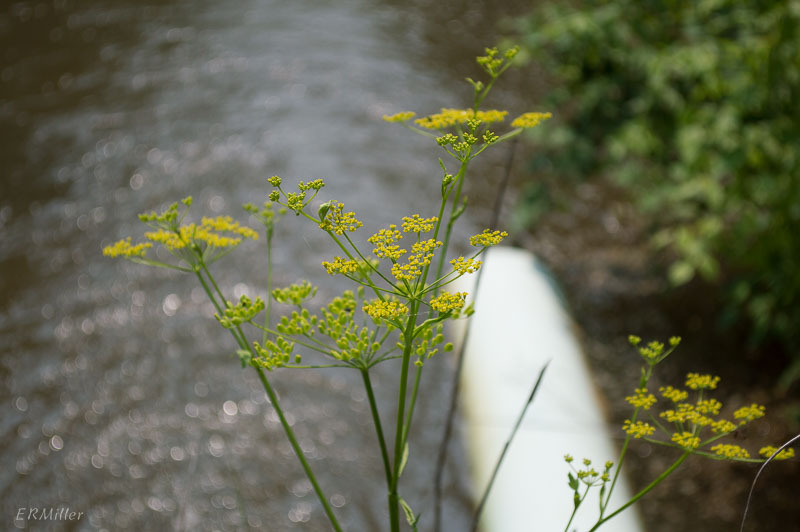 Once again the flowers are in compound umbels, with 3-10 flowers per umbellet and 3-10 umbellets per umbel*. 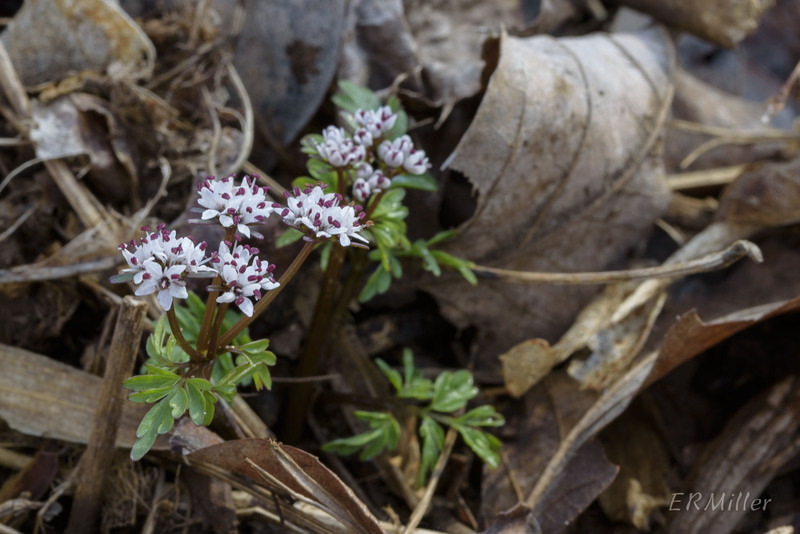 Like clustered snakeroot it grows profusely in Maryland piedmont woodlands. *from Dr. John Hilty’s wonderful Illinois Wildflowers site. Umbellifers can be tasty, and they can be poisonous. And they can be both. 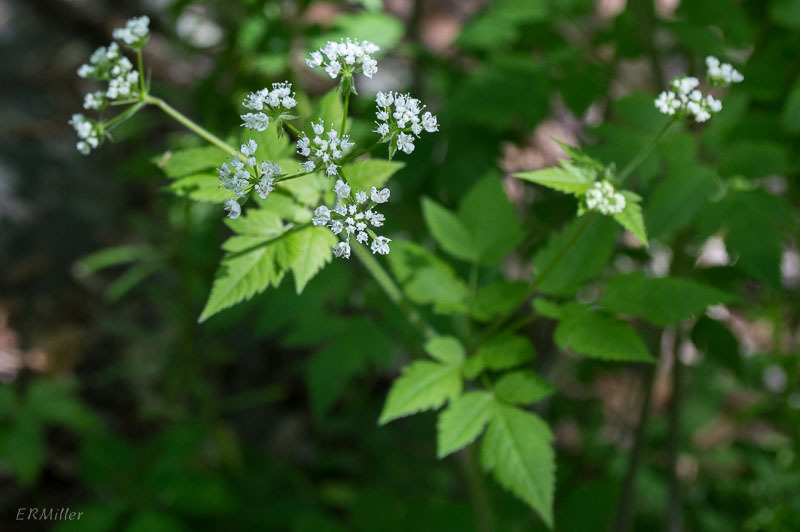 The deadliest plant in North America is a native umbellifer, and the notorious European native pictured here is widespread in the Maryland piedmont. This specimen was right on the Billy Goat C trail. 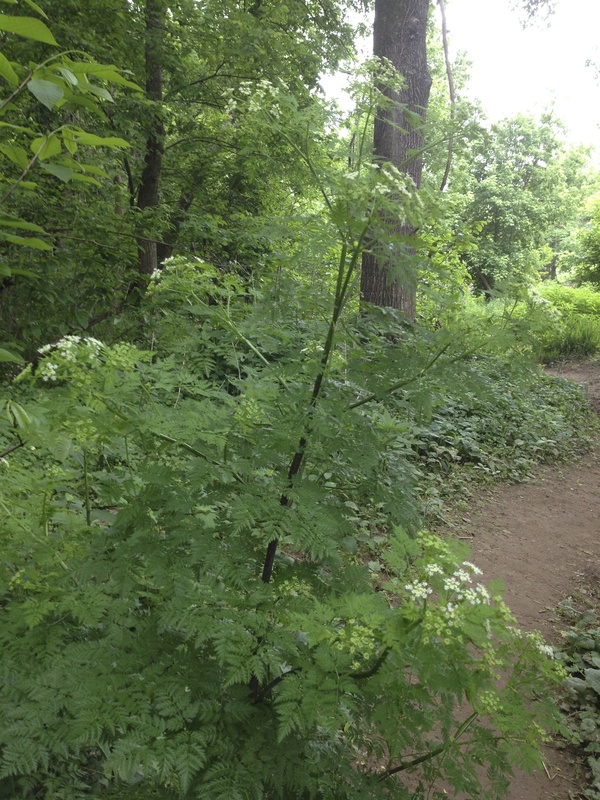 This is Conium maculatum, aka poison hemlock. 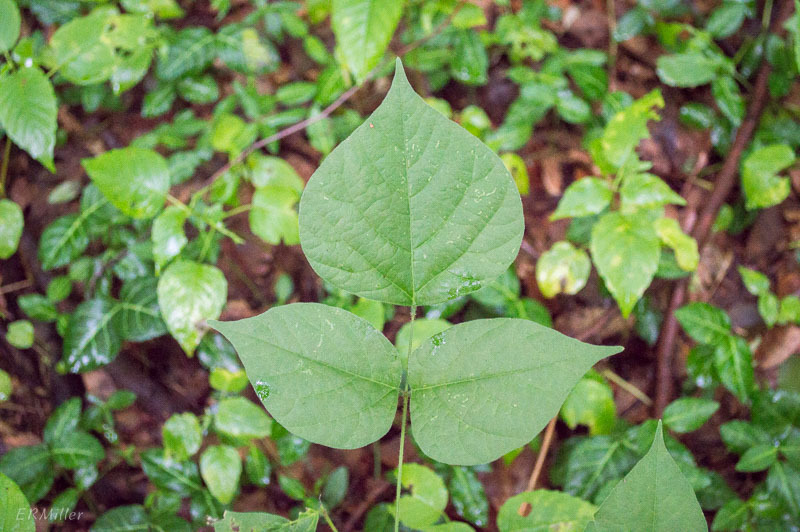 It’s found throughout the US (except Mississippi and Florida) and most of southern Canada, and is on the noxious weed list in eight states. It likes moist soils in disturbed areas and can grow to eight feet tall in its second year (it’s a biennial). In young plants all you’ll see is a basal rosette of leaves. 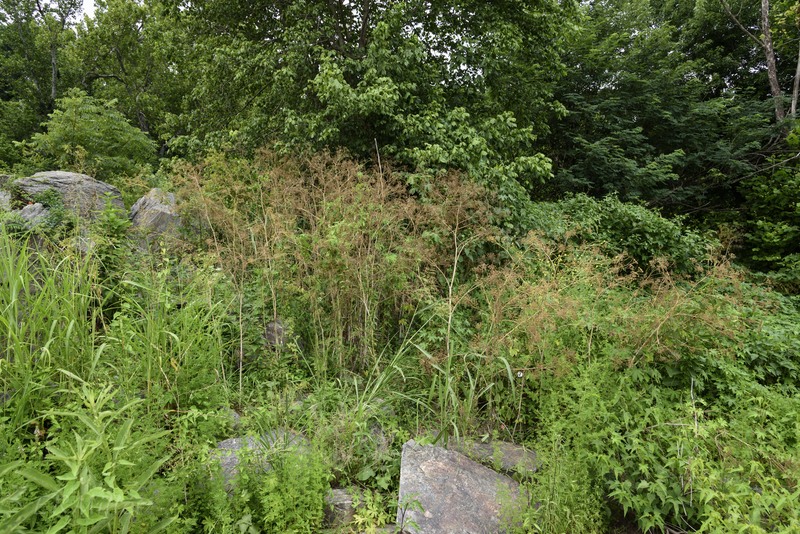 Most of the brown material in the above photo is poison hemlock plants that are dead or dying after setting seed (there’s a still-flowering plant on the left side, but you have to zoom way in to see it). 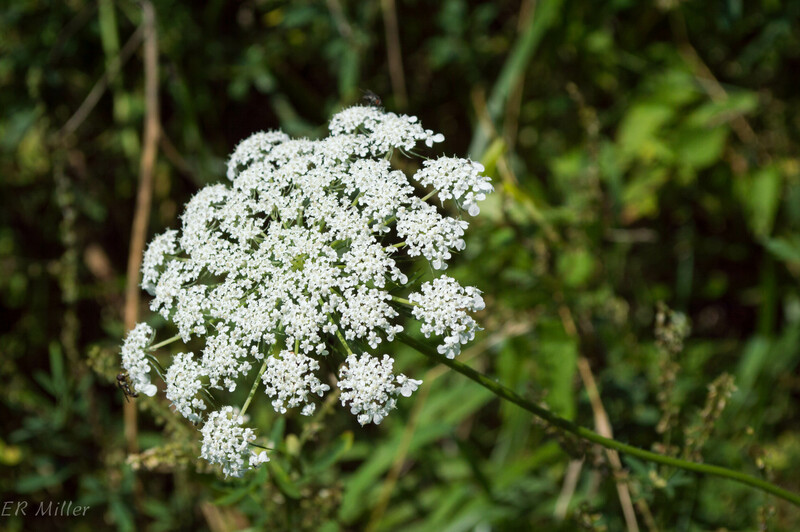 There are five related alkaloids present in poison hemlock, but the one that occurs in greatest concentration is coniine, a peripheral nervous system disrupter. It doesn’t take much coniine to kill an adult human (The LD50 (mice) is in the range of 10 milligrams per kilogram of body weight). Remember that umbellifers often have hollow stems? There are documented instances of children dying after blowing across the tops of cut poison hemlock stems. North America’s deadliest plant is Cicuta maculata, the spotted water-hemlock. It grows in wet areas all over the US and Canada, including the Maryland piedmont. The plant looks similar to Conium maculatum but usually the foliage is not as finely cut, and it doesn’t get quite as tall. Despite being a native it’s on the noxious weed list in Nevada. There are three other species of Cicuta native to North America; of these C. bulbifera, bulblet-bearing water hemlock, has been recorded in Montgomery and Cecil counties, but it is listed as Endangered/S1 (highly state rare). The poisonous compound in Cicuta species is called cicutoxin. It’s a central nervous system disrupter that usually causes death by respiratory failure. The LD50 (mice) is 2.8 mg/kg. 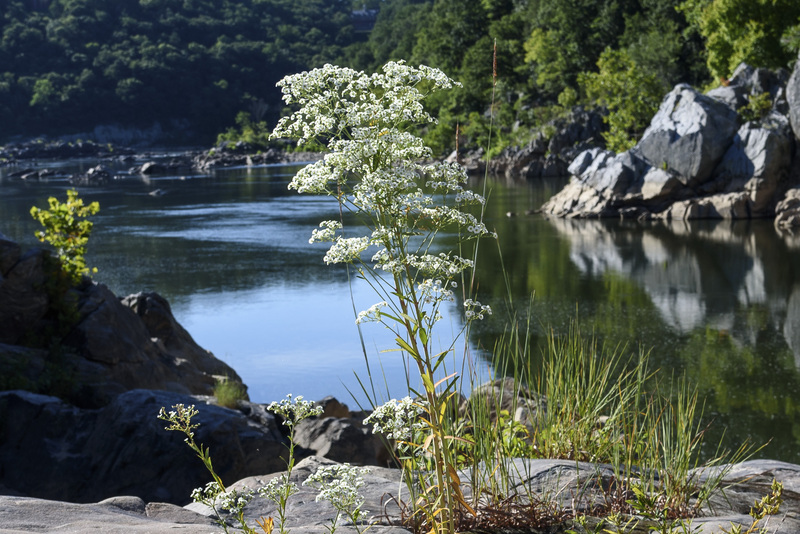 There are a few other species of umbellifers found in parts of the US that have similar toxicity, but none of those are found in Maryland. For the most part the poisonous compounds found in umbellifers fall into two broad categories: systemic poisons and phototoxins. When a phototoxin – say the sap from an umbellifer – gets on the skin, nothing happens. Until the skin is exposed to sunlight. Then there is a reaction that renders the skin highly photosensitive, so that sun exposure causes burns. Second degree burns, even. And the resulting skin discoloration and scarring can last for months or be permanent. Wondering which plants have phototoxic compounds? It’s an interesting list, and includes species in a number of families, including the citrus family. Depending on which authority you consult, most of the vegetable and spice umbellifers at least have the potential to cause such a reaction. This includes anise, carrots, celery, chervil, coriander, dill, fennel, lovage, parsley, and parsnip. Usually the reaction isn’t bad, but it’s a good idea to wear gloves and long sleeves when handling them in the garden. Interestingly, the celery reaction only happens when the celery has been infected with a particular species of fungus. Among the phototoxic umbellifers, none looms as large as the giant hogweed, Heracleum mantegazzianum. I mean that both literally and figuratively. Literally, because this Caucasian native can grow to 18 feet tall. It’s a biennial, so that means it grows to 18 feet in a single season. And figuratively, because the sap is exceptionally dangerous. Crews in New York and British Columbia tasked with removing it suit up head to toe to prevent the sap from touching them. This video has a rather silly intro but basically good information. There’s a lot of good information on the New York State Department of Environmental Conservation website. Giant hogweed is on the federal noxious weed list and on 13 state lists. It’s found in a handful of states in the Pacific northwest, upper Midwest, New England and mid-Atlantic, and North Carolina. The Maryland Biodiversity Project has records for it in Garret, Baltimore, and Harford counties. Giant hogweed has two cousins present in the US, H. maximum (native) and H. sphondylium (alien), both of which are commonly called cow parsnip. The former is present in the Maryland piedmont, but there are no records of the latter in Maryland. Both species contain phototoxins, but are not nearly as dangerous as H. mantegazzianum. Many umbelliferous plants are used as vegetables, herbs, and spices. Here’s a list. But first, a note on terminology: although everyone refers to the spices as “seeds”, they’re actually fruit, specifically a type called schizocarp, a dry fruit that will split into segments, each of which contains one seed; plants in the Apiaceae always have schizocarps that split in two parts. In the text below I’m sticking with common usage and referring to them as seeds. But really they’re fruit. Daucus carota Although the carrot is a biennial plant, the roots are harvested during the first year of growth. 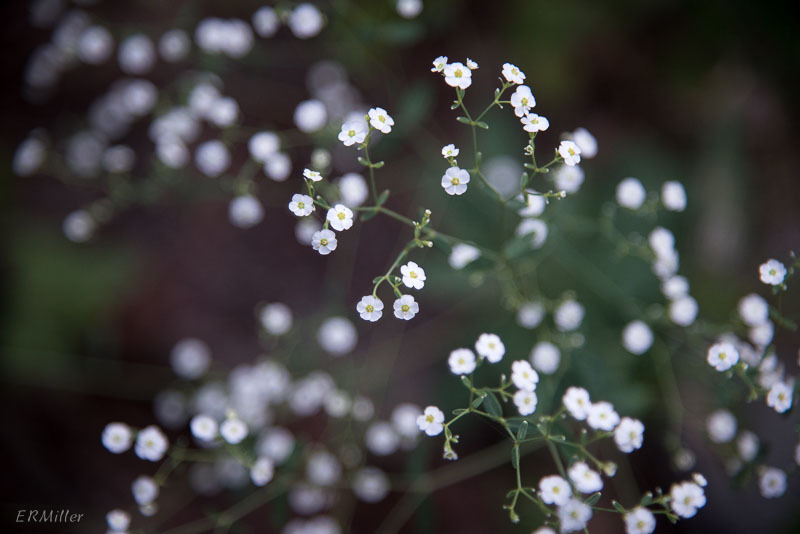 The plant is native to Eurasia, but found in the wild in all the lower 48 states and much of Canada; as wildflowers, they’re called Queen Anne’s lace, and on noxious weed lists in Iowa, Michigan, Ohio, and Washington. Older sources sometimes refer to two subspecies, D. carota ssp. sativus and D. carota ssp. carota; these names are now considered obsolete by ITIS. Pastinaca sativa Like the carrot, the parsnip is a biennial plant whose roots are harvested during the first year. Also native to Eurasia and now established in North America except in the Deep South. Parsnip is a prohibited noxious weed in Ohio. Apium graveolens The stalks, leaves, and seeds of celery are used. The plant is a biennial native to central and southern Europe, southwestern Asia and North Africa. Probably. Celery has been cultivated for so long there’s a lot of confusion about its origins. It’s become established in parts of the US, in an arc running from New York south, west, and then north into Washington. The variety A. graveolens var. rapaceum is grown for the root, called celeriac. Perideridia There are 13 species in this genus, all with the common name yampah. It’s a perennial plant native to western North America. The roots were an important food source for Native Americans. Arracacia xanthorrhiza Arracacha is a perennial native to the Andes, grown for the edible root. Foeniculum vulgare Sometimes incorrectly labeled anise, fennel is a perennial grown for the swollen stalks at the base of the plant (the “bulb”). It’s native to the Mediterranean but has naturalized in much of Europe and in the warmer parts of the US. Fennel is on the California Invasive Plant Council’s Invasive Plant Inventory for moderate invasiveness and severe impact (2006 version). Levisticum officinale The native range of lovage is uncertain; probably Europe or Asia. It’s a perennial and once established can be hard to get rid of. Both the stalks and leaves can be eaten. The flavor is intense, like some sort of super-celery. A little goes a long, long way. Anthriscus cerefolium (sometimes spelled cereifolium) This southern European native is an annual plant that deserves more respect. Chervil is used mostly in French cuisine, in delicate dishes because the flavor is mild. Although the leaves are sold in dried form, don’t bother buying them; the volatile oils are lost during drying and the result is flavorless. Chervil is trivially easy to grow from seed. Petroselinum crispum Parsley is a biennial generally used as an annual, since the leaves can get harsh or bitter in their second season. There are scattered populations established in parts of the US, but it’s not listed anywhere as a weed. It’s native range is uncertain, possibly the Levant or nearby areas. Anethum graveolens Dill is annual, naturalized in much of the US and Canada but native to Asia minor and the Mediterranean. Both leaves and seeds are used. The common name “dill weed” is a clue that this plant is really easy to grow. Carum carvi Caraway is an established alien in Canada and the northern half of the US (more or less), and a B-list noxious weed in Colorado. It’s a biennial native to Eurasia and north Africa. Caraway seed is familiar as the dominant flavor in rye bread and aquavit. Pimpinella anisum I blame Alton Brown (of Good Eats fame) for the increasingly widespread mispronunciation of the word “anise”. It’s pronounced ANis, not anEECE (google it). The plant is an annual native to southeastern Europe and southwestern Asia. My Italian forebears would roll in their graves if I used anything other than anise seed to flavor pizzelles. Myrrhis odorata Both the leaves and seeds of cicely are used as a flavoring, though the use is not widespread. The plant is a perennial native to south-central Europe, with scattered naturalized populations in the US and Canada. Coriandrum sativum Called cilantro for the leaves, shoots, and roots, and coriander for the seed, this annual is native to southeastern Europe, southwestern Asia, and north Africa. It’s present in parts of North America but not listed as a weed by any authorities. Eryngium foetidum Grown for the leaves, culantro (often confused with cilantro) is used in Southeast Asia, the Caribbean, and Central America. It also grows in Georgia and Florida. I can’t find any authoritative information about its native range, but it is a tropical annual. Cuminum cyminum Cumin is an annual plant native to the eastern Mediterranean and central Asia. 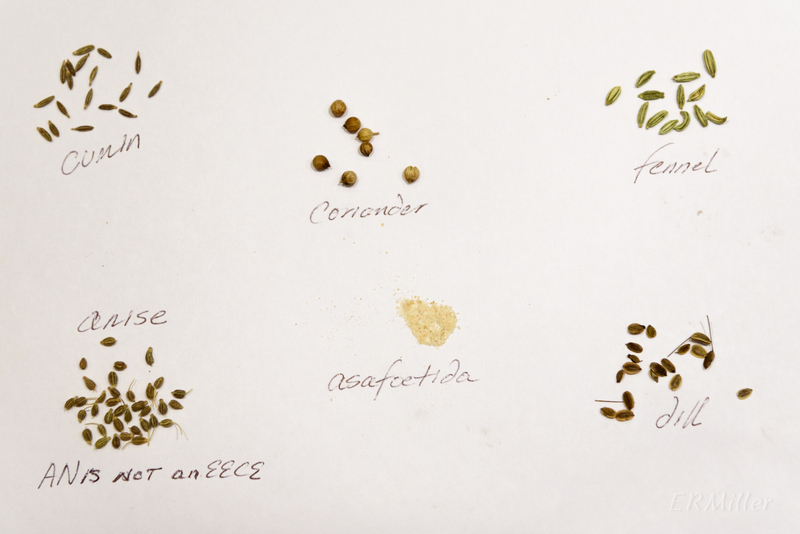 The seeds are used in many cuisines around the world. Bunium bulbocastanum The seeds of this perennial plant are known as black cumin, black caraway, and kala jeera. It’s native to southeastern Europe and south Asia. Trachyspermum ammi Ajwain is an annual native to south Asia, grown for the seeds. Ferula assa-foetida The dried and ground sap or resin of the roots of this perennial is called asafoetida. The powder is used sparingly in various Indian cuisines, more as a flavor enhancer than a flavor in itself. The plant is native to western Asia. Many umbelliferous plants contain poisons of various sorts, including some of the plants described above. More on that next time.